The sculptures painted by the Mandarin “Frog Man” are available at the Mandarin Museum gift shop and nowhere else…but you can paint your own frog, squirrel, or turtle at one of our painting parties! · Frogs and squirrels are $20, and sea turtles are $24. · Please reserve a spot by emailing mandarinmuseum@bellsouth.net or calling (904) 268-0784. · Let us know how many and which ones you want to paint. In 2015, a life-long Mandarin resident began making and painting concrete frogs to place along the roadside. His original intention was to simply bring a smile to passersby with his colorful, one-of-a-kind creations. Eventually, he approached the Mandarin Museum to offer the frogs as a fundraising project, with the entirety of the sales going towards our development and programming. Since the beginning, he has not wanted us to publicize his name or show his face in photos. 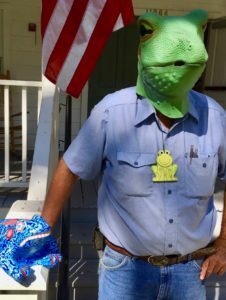 Instead, he is publicly known only as the “Frog Man.” If you’ve caught him at a museum event, you’ve likely met him, but he continues with the fun and mystery of being the Mandarin Frog Man. He began the project as a hobby, but has become a local folk artist who inspires others through the joy and creativity of his work. Nearly 2000 of his creations are now in Mandarin yards (and across the world), and he has been featured in several news articles, interviewed by WJXT, and has become a full-fledged Mandarin Museum & Historical Society volunteer. We can never thank the “Frog Man” enough for all that he’s done for the Mandarin Museum & Historical Society and the community as a whole! !